Two lactating African elephants at the San Diego Zoo’s Safari Park are part of a study of the nutritional content of their milk, the zoo announced Wednesday. Umngani and Ndulamitsi each gave birth to healthy calves last fall. Zoo staff have trained them to voluntarily participate in milking sessions two or three times per week and plan to study the milk’s contents and composition. According to the zoo, the information will be used to develop higher quality milk substitutes for hand-reared calves in other zoos and the Reteti Elephant Sanctuary in Kenya. San Diego Zoo Global is a partner of the Retiti Sanctuary, located in Kenya’s Namunyuk region. According to the zoo, elephant calves brought to the sanctuary usually arrive stressed and unhealthy, raising the importance of them receiving adequate nutrients from bottle feedings. The births of the two calves at the zoo will also enable animal caretakers to monitor their daily activity, physical development and bioacoustic communication. 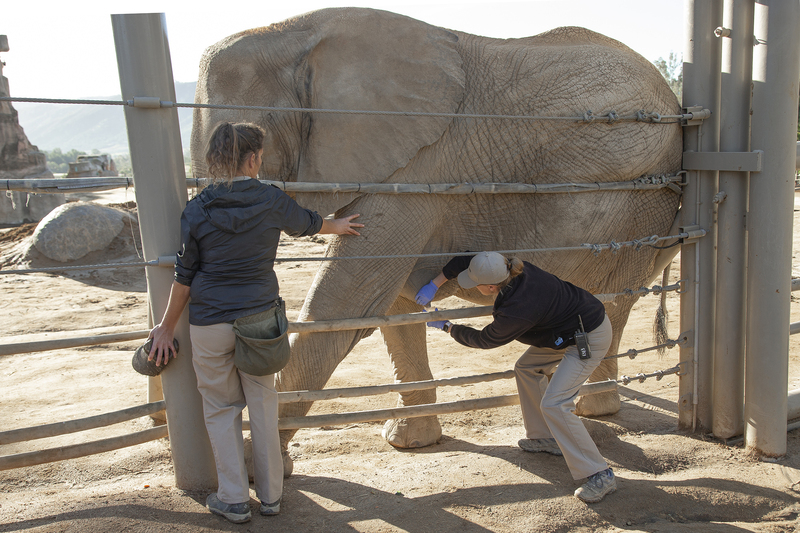 This research will subsequently allow staffs at both the zoo and the Retiti Sanctuary to continuously improve their caretaking efforts for young elephants.